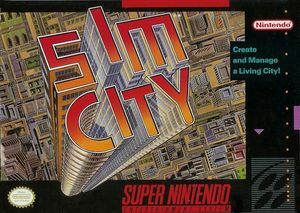 SimCity is an urban development simulation game developed and published by Nintendo for the Super Nintendo Entertainment System. Start with a fledgling town and build it into a metropolis. Or, take on the challenge of rescuing a city overwhelmed with problems. Either way, taxes, zoning, crime, transportation, education, fire control, and other critical issues are in your hands. Time is passing, and every decision you make has a future consequence. Your assistant, Dr. Wright, can help you make the right decisions. Just ask! Surprise catastrophes also threaten your growing city--fire, earthquakes, airplane crashes, even a giant Koopa who has a nose for industrial pollution! Will you build the ideal city? Or will disgruntled citizens leave you with a ghost town? Since its re-release in 2006, SimCity has been removed from the Wii's Virtual Console service. However, people who have already bought and downloaded the game can still play it. It is unknown whether this is specific to the North American release or affects other regions as well. The graph below charts the compatibility with SimCity since Dolphin's 2.0 release, listing revisions only where a compatibility change occurred. This page was last edited on 27 December 2017, at 06:58.